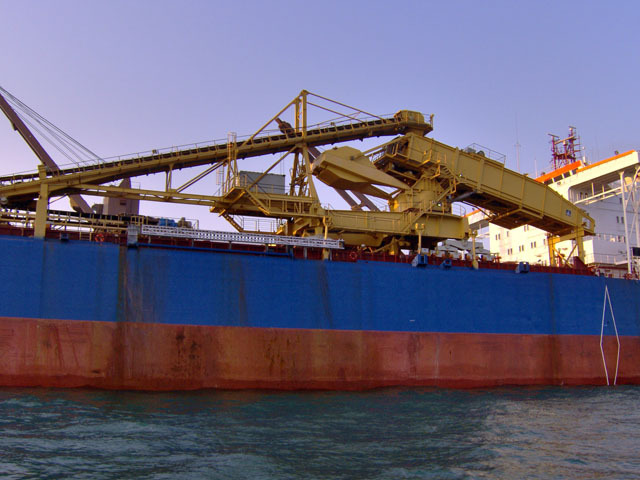 The hull of the transhipment vessel retains its original design features, and additionally was fitted with cargo hoppers of appropriate design in existing holds. The hull and cargo hoppers were strengthened for homogeneous and alternate hold loading under all conditions. The tank top was strengthened for hopper supports, and bulkheads are capable of sustaining one-side loads. All deck outfits are optimised for safe and efficient mooring and self-unloading operations and warping using a minimum crew. The hoppers are outfitted with hydraulically operated gates and a continuous conveyor system on the tank top centreline for self-unloading operations. 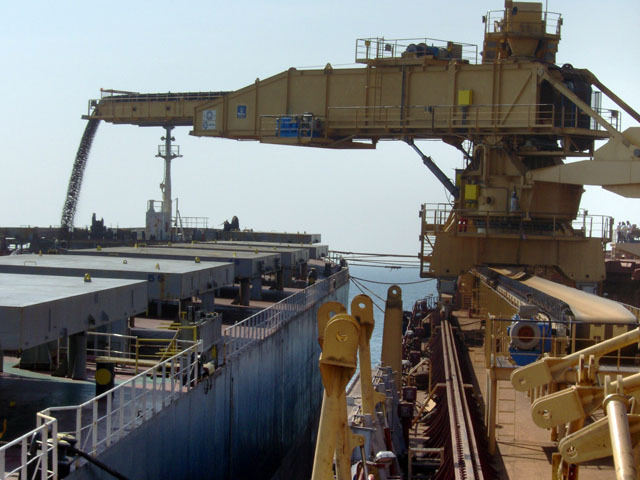 This conveyor system transfers the cargo at the forward deep tank on to an elevating C-loop conveyor, which transfers the cargo further via a deck conveyor system onto a ship loader. 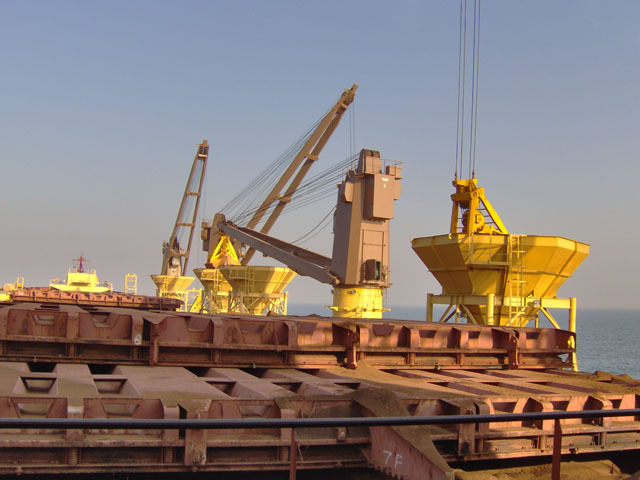 The supplied self-unloading system is designed to carry free flowing material in bulk, such as gypsum, coal, iron ore pellets, aggregates and discharge at a continues rate of 4 500 tonnes / hour of SG 1.8 iron ore. 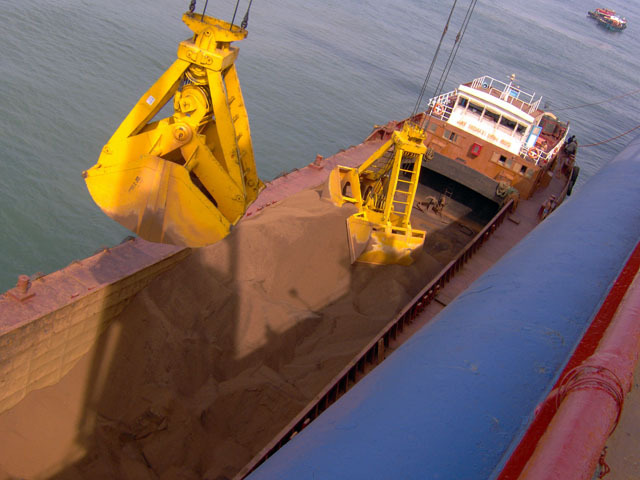 The Goan Pride Transshipper, herein referred to as the SBT, is designed to handle iron ore in the form of ‘lumps’ and ‘siliceous fines’, with bulk densities ranging between 1.6 and 2.2 tonnes / cubic metre and a maximum lump size of 125 mm. Material moisture content range is between 6 and 13%. Ocean going vessels can range in size from 40 000 dwt to 300 000 dwt with the norm at approximately 150 000 dwt. The maximum airdraft of any of these vessels on arrival at the SBT site is 20.0 m as measured from water surface to top of hatch cover. The design basis for the conveyors is 4 500 mtph of SG 1.8 material. Belt feeders located below the receiving hoppers are rated for normal discharge of 1 000 mtph and maximum discharge of 1 125 mtph. Grab cranes are rated for 20 tonne cargo lift with cycle times in the order of 30 to 40 cycles / hour. The material handling system is capable of operation with maximum list and trim of 2 degrees and 1.5 degrees, respectively. Maximum wind speed for operations is 55 kilometers / hour. Actual cut-off point for material handling operations is Beaufort 4 (moderate breeze). The Sea Bulk Transshiper (SBT) for Goa, India is a geared bulk carrier with a self-unloading system for the purpose of transshipping mainly iron ore. 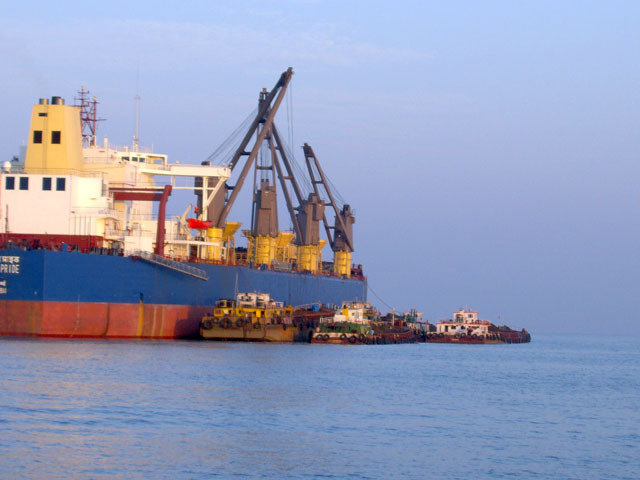 Ore carrying barges are loaded up the Mandovi and Zuari Rivers near the mine. 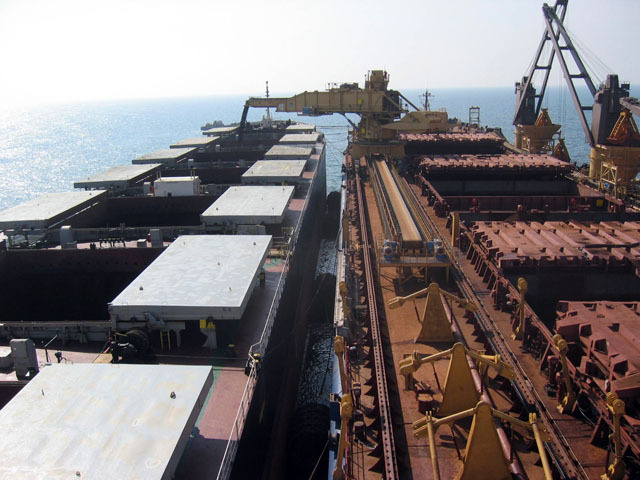 The barges will travel 22 nautical miles out to deeper water near Marmagao where the SBT will be used to transship the iron ore into cape size ocean going vessels.